TIE DYE – a brilliant, gorgeous rainbow blend! This Expression Fiber Arts signature sock yarn is perfect for hand-knit socks, shawls, modern baby clothes and hats, accessories, mittens, stuffed animals and anything else you can think of! 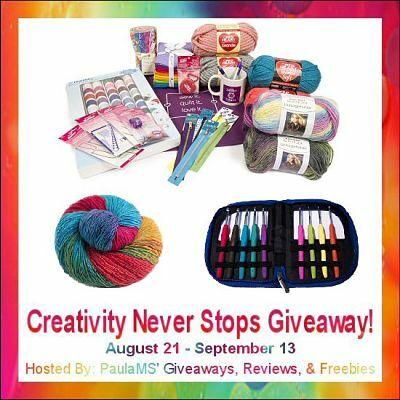 two great prize packages that are sure to get your creative juices flowing!What will you create? Follow PaulaMS’ Reviews, Giveaways, & Freebies’s board You Can Do It! – Crochet & Knit on Pinterest. Follow PaulaMS’ Reviews, Giveaways, & Freebies’s board You Can Do It! – Arts and Crafts on Pinterest. By following us on our social networks and by email we are able to bring you the best giveaways possible! Please take a minute to “like” us on Facebook!Chances of winning depend on entries received. Disclaimer: PaulaMS’ Giveaways, Reviews, and Freebies nor any blog promoting this giveaway, is not responsible for the awarding of the prize. Sponsors are responsible for prize fulfillment.Any Questions about this giveaway? Email Paula At paula_stewart (at) ymail (dot) com. Next post: College Bound, Time to Pack UP and a $300 Staples Gift Card Giveaway!